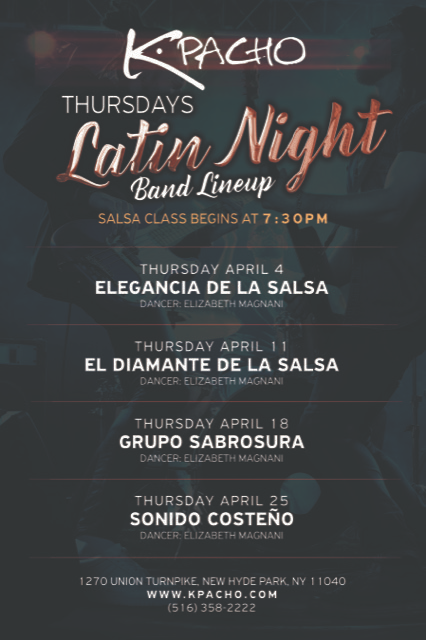 Join us at 9pm as see Latin Night with Sonido Costeno Live along with Dancer Elizabeth Magnani teaching the salsa lessons at 7:30pm. Every Thursday… Hot salsa dancing and our Killer Margaritas characterize the Kpacho experience. Whether you’re an amateur or an advanced salsa dancer, patrons of all skill sets flock to bust a move to our live performances each week. If you’re new to salsa dancing, partake in an in-house lesson and get ready to show off. Come early and enjoy dinner before heading to the lounge and dancing the night away! We always have something new and exciting to share at Kpacho. Sign up for our email and never miss out! For more information about hosting your event at KPacho, complete this form below and we will contact you within 24 hours. You can also reach us at (516) 358-2222 and contact our Catering Manager.